The Livestrong LS7.9E elliptical debuted in December 2009 as a non-incline budget model in a new brand of cardio fitness machines made by Johnson Health Tech and endorsed by pro cyclist Lance Armstrong. Priced at just under $800, the Livestrong LS7.9E comes with several advanced features that have only been seen before on models in the $1000-$1500 range. Unit Weight/Dimensions — 156 lbs; 73" x W: 24" x H: 65"
UPDATE: Johnson HealthTech is no longer selling any ellipticals or treadmills under the Livestrong brand. Check out Horizon and Vision for comparable machines. 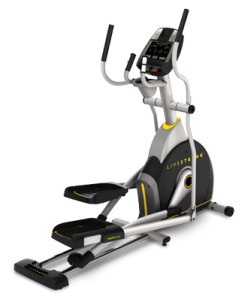 The Livestrong LS7.9E elliptical trainer comes with many of the same standard features of the mid-range trainers, the LS9.9E and the LS12.9E, including a SixStar Certification™ frame for optimum body posture and ergonomic comfort, 20" stride length, 23-lb flywheel, in-console speakers and mp3 compatible plug-in, and 0" Q-factor pedal spacing. The other two models are slightly beefier with a higher user weight capacity and a few more programs, and they offer 21 incline levels which the LS7.9E does not. The first elliptical reviews of this new model are decidedly mixed. While some consumers have had no trouble with their machines, others have experienced issues with the pedals disengaging and some other “out-of-the-box” problems. Johnson Tech has issued a product recall on all three Livestrong 2009-2010 models to fix the design flaws. Those customers who haven’t had problems report that the LS7.9E elliptical is a decent performer: sturdy, quiet, easy to use, and comfortable to ride. At $799, the entry-level Livestrong LS7.9e elliptical trainer has potential to be a good buy in the future, but we’ll take a wait-and-see approach until the voluntary safety recall issues are resolved. If you are ready to make a purchase, skip the Livestrong ellipticals and go with a trainer with a proven track record. Check out the machines in this price range which are rated as “Best Buys” — the Schwinn 430 for $799, or the Sole E25 elliptical trainer for about $300 more. UPDATE: Spring Elliptical Sales are going strong! Here is your chance to rant or rave about the elliptical you use at home or at the fitness center.